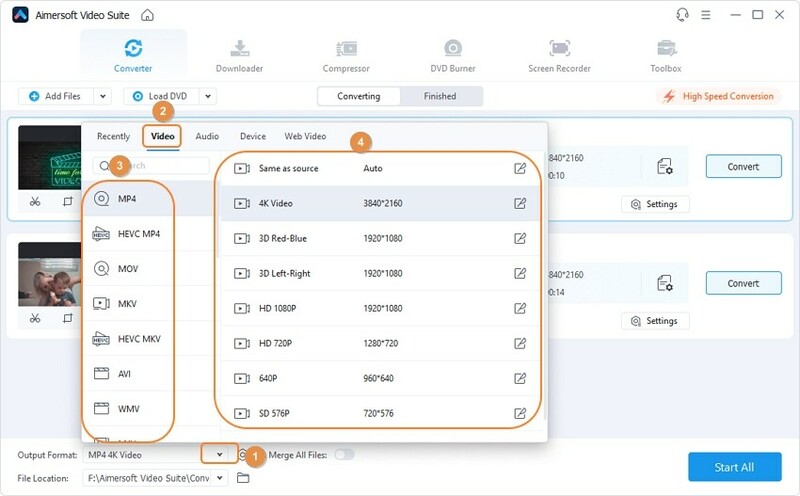 Aimersoft Video Converter Ultimate is the best HD video converter, enabling you to convert video to any different format, including MP4, MKV, WMV, AVI, MOV, MPEG, etc. And you can convert DVD to MP4/ISO/AVI or other formats. Let’s learn the step-by-step guides below. Download and install Aimersoft Video Converter Ultimate on your Windows PC or Mac, and then open it. From the Convert tab, click +Add Files to load videos on your computer. Click the Open button to add the files. 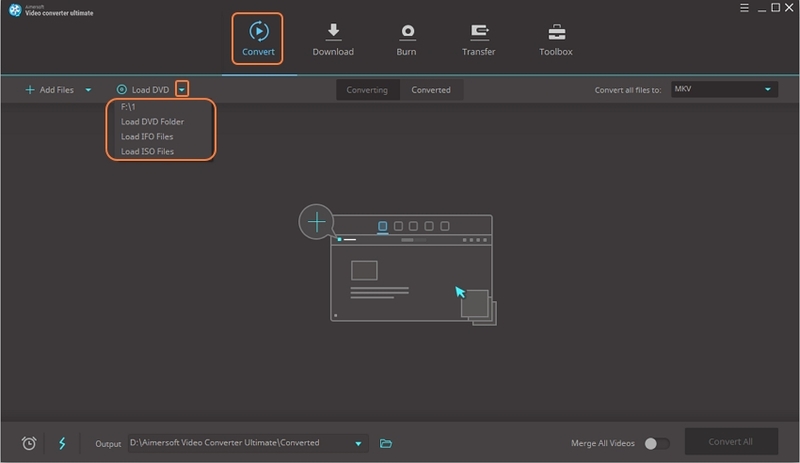 Alternatively, you can drag and drop the video files to Aimersoft Video Converter Ultimate. Batch conversion is supported here. You can add multiple videos at one time. For more ways to import video files, please see the Tips below. Tip: If the target videos are on the device (e.g. iPhone, Android, external hard drive, or camcorder), you can connect the device to the computer using USB cable. Videos can be imported directly from the device. If you want to convert all the added videos to thea same format, click the drop-down icon near to the Convert all files to option. From the pull-down window, select the Video tab. You will see all the supported output formats like MP4, MOV, MKV, AVI, and WMV. Select the one that meets your requirement. Next, choose a resolution for it. By choosing Same as source, the output videos will maintain the original quality and resolution. 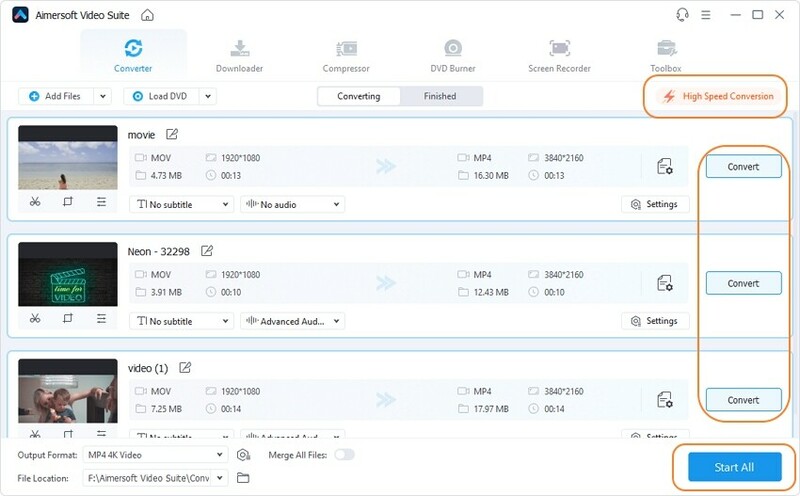 Tips: Similarly, you can convert videos to preset formats for YouTube, Facebook, Vimeo, or Instagram under the Video tab, or convert videos to audio (MP3, WAV, M4A, WMA, AAC, etc.). And if you want to convert video for iPhone, iPad or Android device, click the Device tab and just select your phone model. There are iPhone, Samsung, Huawei, HTC, LG, Google, Sony, etc. 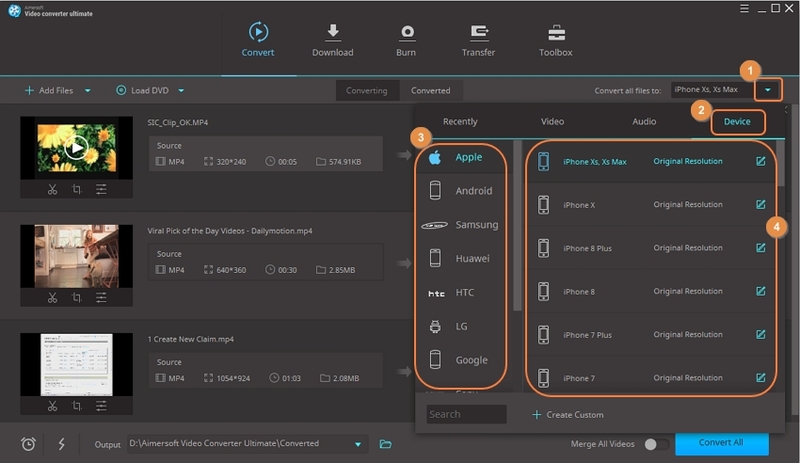 Aimersoft Video Converter Ultimate will convert videos to the format that is compatible with your phone. Finally, You’re optional to turn on the High Speed Conversion to speed up the process, and change the output folder. Then click on the Convert All button. All the added videos will be converted at the same time at high speed. When the conversion process is over, you can click the Converted tab to find the converted videos. Clicking the Play icon over the video thumbnail, it will start playing the video within the program. Or you can click the Folder icon to locate the converted videos on your computer. Insert the DVD disc to the DVD drive on your computer. From the Convert tab in Aimersoft Video Converter Ultimate, select the drop-down icon beside Load DVD. This will allow you to select and load your inserted DVD disc. Other choices include Load DVD Folder, Load IFO Files, and Load ISO Files. From the pop-up window, choose Main Movie or All Movies. Then click OK to starting loading videos from DVD. When the videos from DVD have been loaded, you will need to select an output format for the videos. From the Convert all files to option, click the Video tab and it will present you all of the supported output formats. From the right side of the format, you can choose Same as source to keep the original quality. Or there are also other resolutions for your video, you can select the one your need. 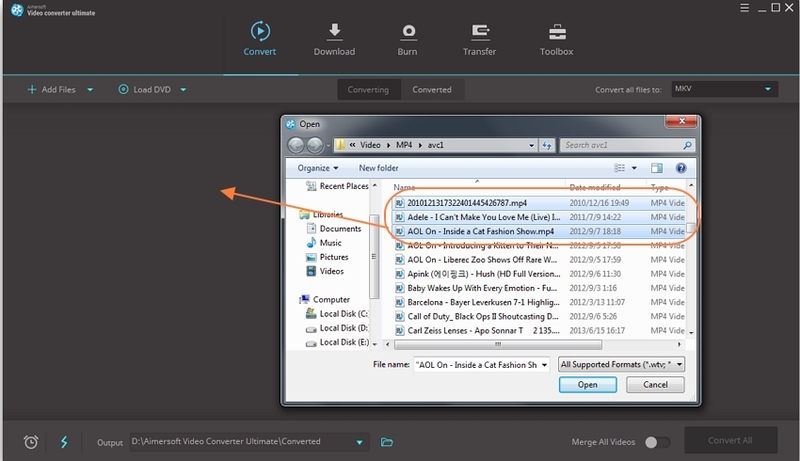 Tip: Before converting DVD to MP4 or other formats, you are allowed to edit the DVD videos with the built-in video editor (See how to edit video in Aimersoft Video Converter Ultimate >>). Lastly, turn on High Speed Conversion option and check the output address, then click on the Convert All button to start converting DVD. When the converting process is over, find the videos from the Converted tab. You can click on the Folder icon to open the destination folder and view your converted videos. 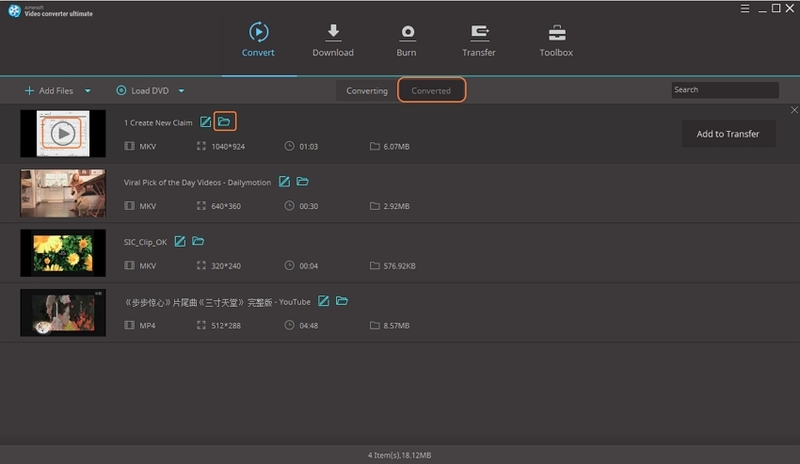 There are several ways to add videos or audio files to Aimersoft Video Covnerter Ultimate. Let’s learn them one by one. Add from Camcorder: to Add files from the connected camcorder. This is the easiest way to add files. 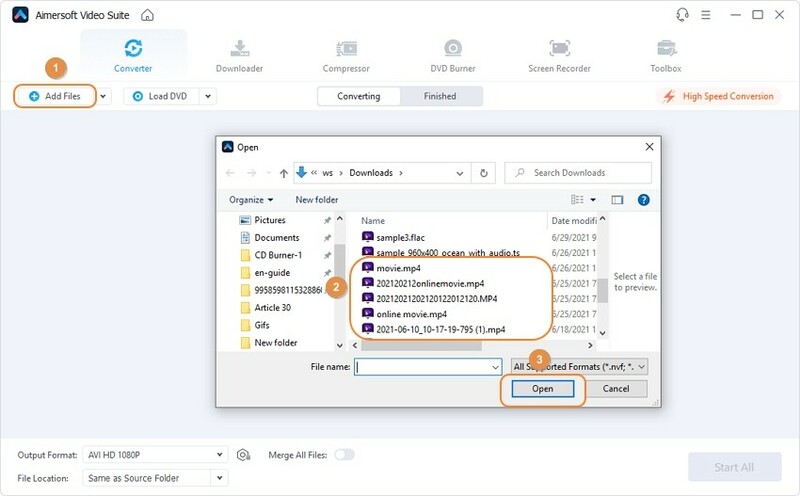 Select the target files from your computer, drag and drop them to Aimersoft Video Converter Ultimate. The files will be added. If you are on a Mac, you can add the files from the Media browser directly. Click the Media Browsers option at the top-right corner. Then from the new window, find the video or audio files from iMovie, iTunes and others. Choose them and click the + icon at the bottom-right corner to load the files. Or you can click on the Play icon to preview the file before loading.